At Suffolk Federal, conveniently located on Long Island in Suffolk County, NY, it’s important to us to keep you informed on the latest promotions and great ways to save, community and news, exciting membership benefits, upcoming events and Suffolk Federal member and staff highlights. As you flip through our Outlook eMagazine, you’ll find important information on loans, home improvement options, retirement and financial planning and so much more! 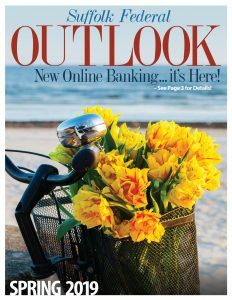 To sign up for email delivery of our Outlook eMagazine, email* us at sfcumail@suffolkfcu.org with the request “Sign me up for Outlook!”—it’s that easy!